What a fun project. My daughter needed doors to separate her laundry room from her studio in her basement. My husband finished the studio portion of the basement for her, and left a larger than normal opening for the doorway in the event they ever needed to swap out the washer or dryer. So she needed something "unique", not only due to the size of the opening, but also since it would be on the studio side of the basement and she had worked really hard creating the look that she wanted for that area. 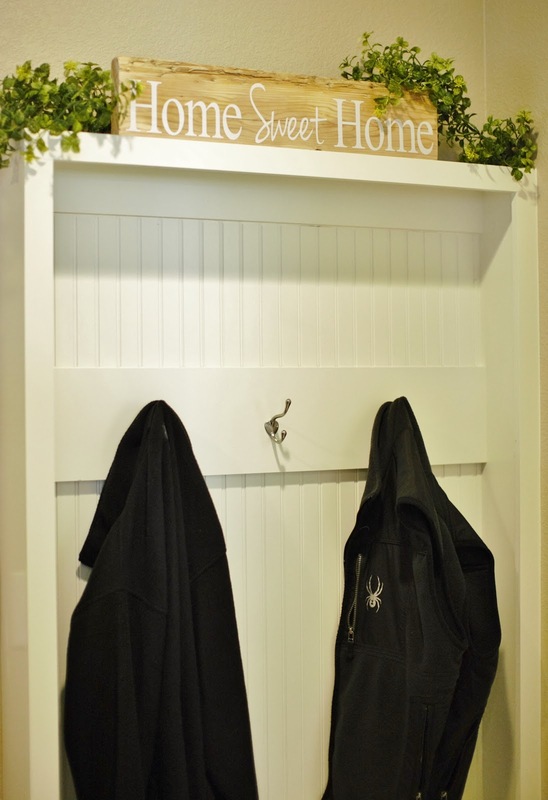 My mind went to "old" doors, we also talked about a barn door.....I had shopped a local surplus store a while back and was enamored with the types of home improvement items you could find there. Bud's Warehouse, carries all sorts of new and donated home improvement items at very reasonable prices. 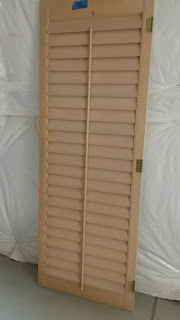 I had found brand new cabinet doors there some time ago, and remembered they had lots of doors too. After wandering around, there were some shutters that caught my eye. 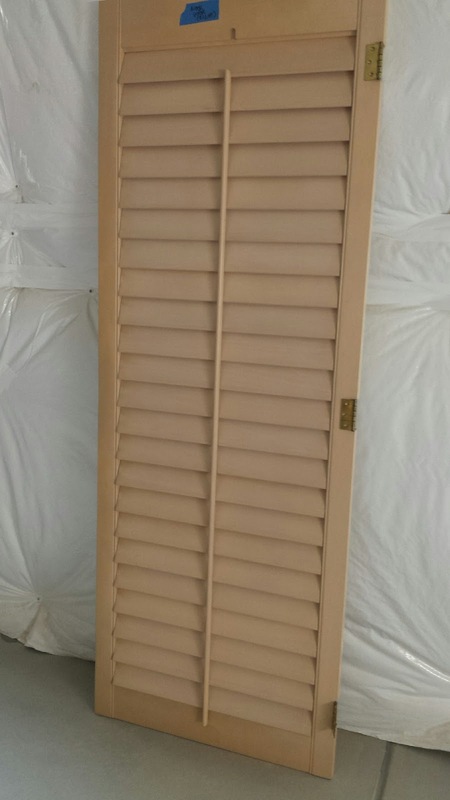 It turns out multiple sizes of the same shutters were donated by a gentleman who removed them from his home. A set of two of the large size would fit almost perfectly in the opening and would be a fun alternative to a run of the mill door! At only $15 each, it was a steal of a deal. A couple cans of spray paint and they'd look SWEET! 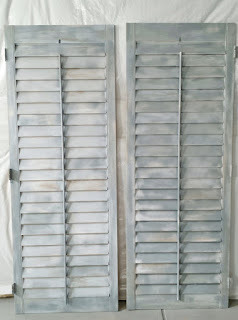 The shutters were a tan/beige color and we thought they would look nice as a distressed bluish/grey. 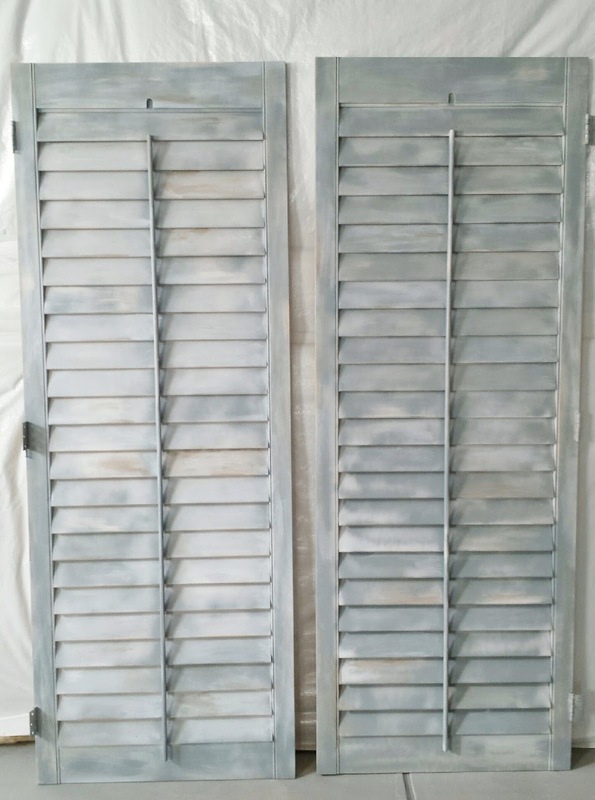 I had distressed an old dresser and nightstand for her a couple years ago that she uses in the studio and we wanted the shutters to compliment those two pieces. Because my basement is yet to be finished, I set up a couple of saw horses and some plastic sheeting and went to town. I first spray painted a base layer of white on the doors, followed by some grey. After that, I propped them up against a wall and started "whitewashing" some white and brown areas for a more weathered look. Standing them side-by-side, I could ensure they looked like a matched set. Oh my gosh! They look so good in her studio. She had purchased a couple of vintage looking door knobs on sale at Hobby Lobby (of course, I've taught her to use the weekly 40% off coupon whenever possible) in her logo color of teal as the finishing touch. 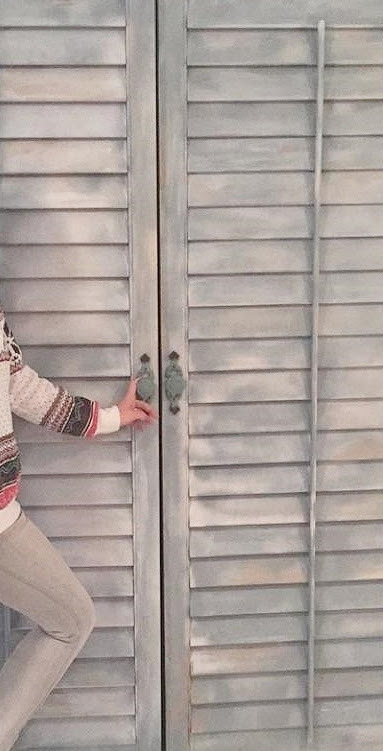 So for just under $50 she has a totally unique and functional set of doors for her studio.....even better, she has used them as a backdrop already too, and they look great in pics! Love it!! 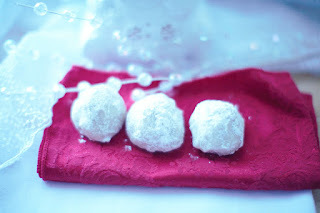 This recipe has been a part of the family Christmas cookie collection since the '70's! My Mom introduced them back then and since they were a winner with absolutely every family member, she continued including them up until the final batch she made for all of us for Christmas 1998. My Dad took over the cookie baking in 1999; the year after my Mom passed. It was so sweet and sentimental of him continue the tradition. I took over in 2002, after my Dad passed, and have continued to keep them as part of my repertoire ever since.....and frankly, I don't see them ever going away. Beat the butter, sugar and vanilla until light and fluffy. Add the flour and nuts, blend well. Chill the dough for approximately 1 hour. Pre-heat oven to 375 degrees. Remove foil from kisses. 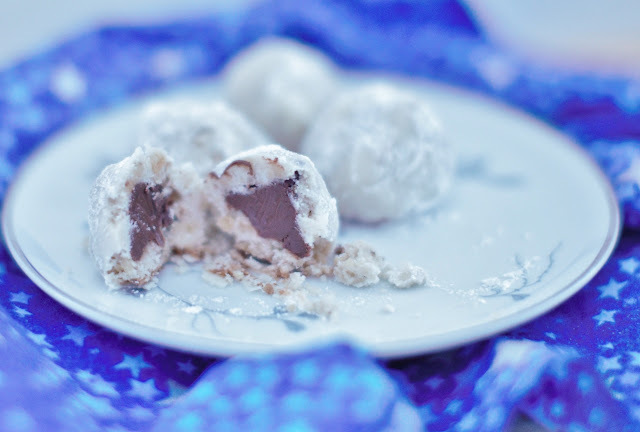 Shape the dough around the kisses, then lightly rolling them to form a ball, completely covering the kiss. Place on an ungreased cookie sheet. and bake for 12 minutes, until set but not brown. While warm, roll the cookies in powdered sugar. 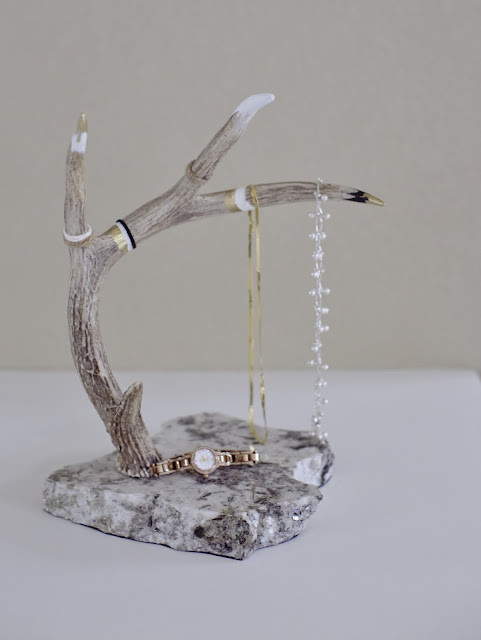 Transfer to a wire rack until completely cool. It's always fun for me to make a house a true home, by decorating it to reflect our personalities. 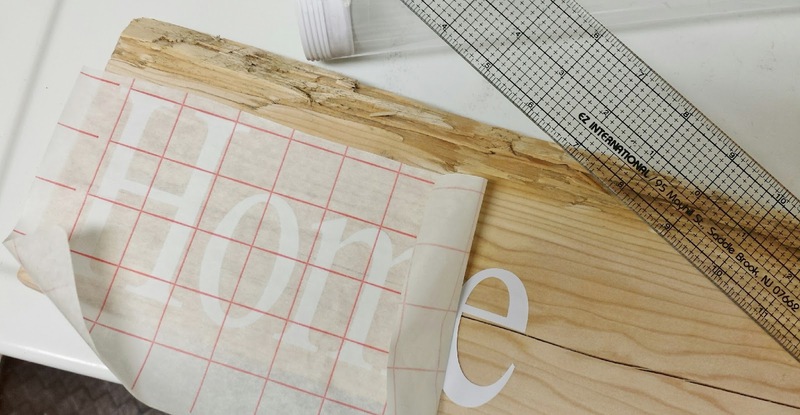 Having just moved into a new home, my creative wheels are spinning. We still have a lot of boxes and furniture in storage, so it will be like "Christmas" for me when we do get a chance to unload those items (we have to finish the basement first)! In the meantime though, there are a few projects I've been working on along the way. 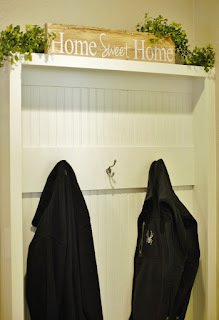 This first one was super simple, but adds a really nice touch to the built in coat rack we have in our house. It's a little tough to capture this particular spot in pictures since it is in the corner of the entryway from the garage, which is a bit dark. So I apologize for the shadows being cast on the sign. Being in an area with new construction, there are many dumpsters throughout our neighborhood and the craftsmen are always discarding things. I rummaged through their discard pile the other day and found this roughed up piece of wood and brought it home. It was just what I needed for my sign! I sanded it just a smidge so that that vinyl would adhere nicely, but left the weathered and splintered edges as is. I made the sign using my Silhouette machine and this project was finished in just about an hour. To finish it, I painted two light coats of ModPodge on top of the letters when I was finished to give it some additional protection.....and there you have it! It's just what this little corner of "our world" needed. What could be better than peanut butter and chocolate together in a "no-bake" recipe? Is that crickets I'm hearing.....that's what I thought. This dessert is so tasty! I recently made it for a family gathering and decided to double the recipe since we are dessert lovers. Let me tell you, the 9 x 9 version would have been plenty big enough. 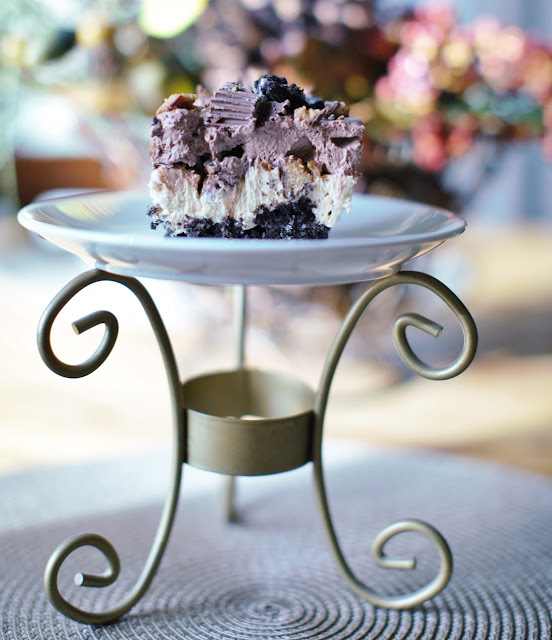 It is rich and loaded with flavor, so a small piece is just right. I'll be sharing the "original", which will satisfy approximately 6-8 people. In a large bowl, beat the cream cheese, peanut butter and 1 cup powdered sugar until smooth. 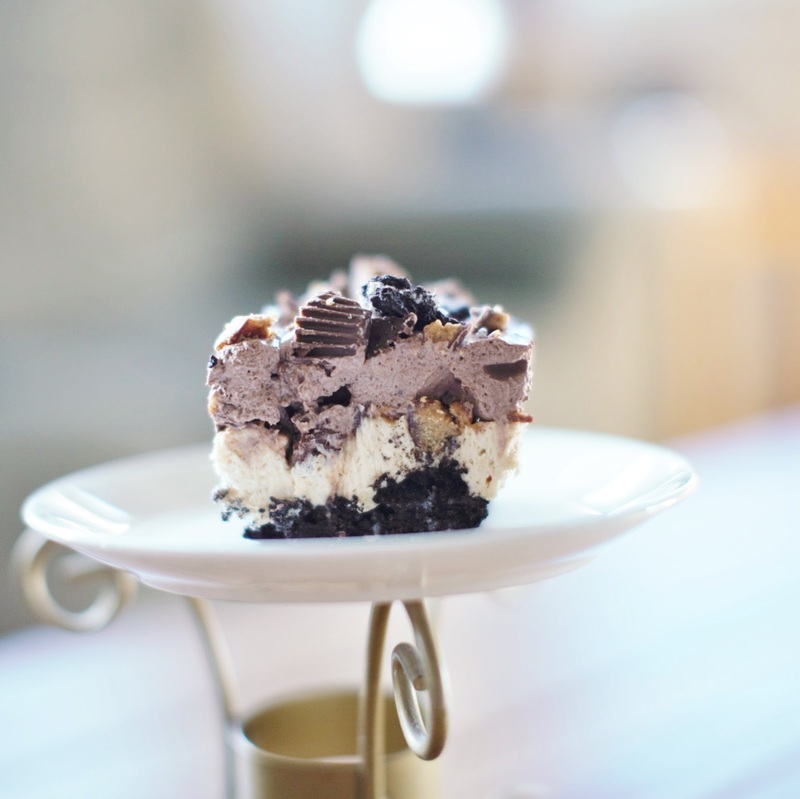 Fold in half of the whipped topping and spread over the Oreo crust layer. 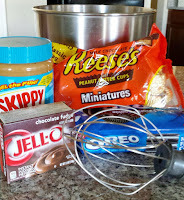 Sprinkle with the chopped peanut butter cups but reserve some to sprinkle on the top. In another bowl, beat the milk, pudding mix, and remaining ½ cup powdered sugar on low for about 2 minutes. Let stand for two minutes. Fold in the remaining whipped topping. Spread on top of the peanut butter cups. Sprinkle the top with the remaining crushed Oreos and peanut butter cups. Cover and chill for 3 hours before serving. Thanks to: The Recipe Critic for the recipe! 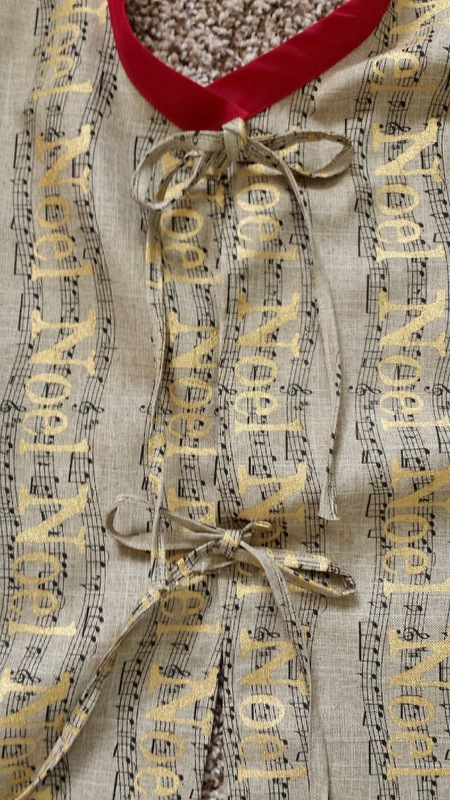 A little birdie dropped a hint last Christmas that she hoped Santa would bring her a Christmas tree skirt. Unfortunately, when the hint was shared, their tree was already up and time just flat ran out for me to create something. So, Santa filed that hint away for this Christmas. And now, I can gift it early to make sure it's ready for this holiday season. I found a cute neutral cotton fabric for the skirt itself and decided to give it a splash of color by using red seam binding to finish the top and bottom edges, as well as red felt poinsettia flowers on the front of the skirt. 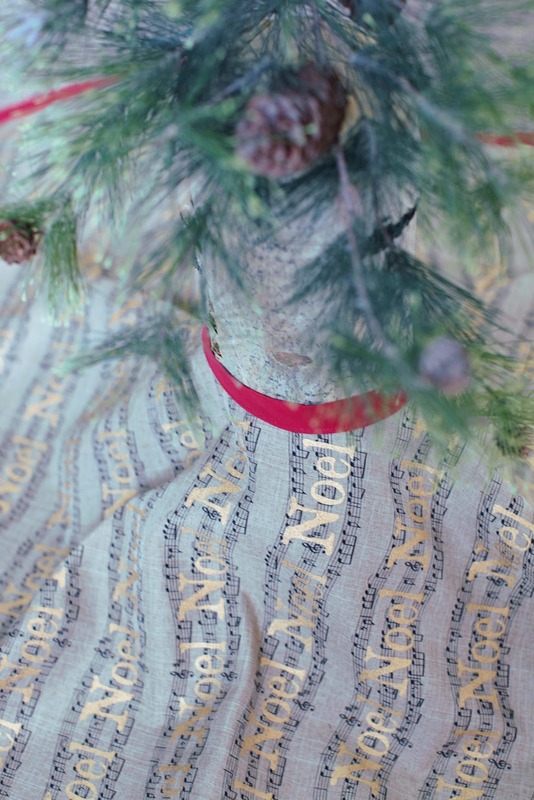 If you've never made a tree skirt, it's so simple. Let me share some of the tips and tricks. 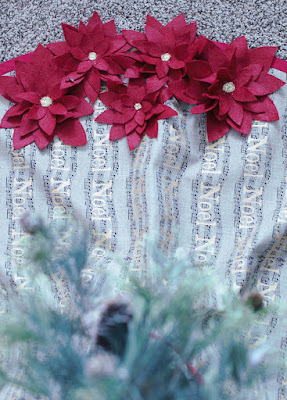 First, once you find your fabric (you'll need about 1 ½ yards since most holiday cottons are about 45" - 54" wide) you'll fold it in half and then in half again to make a square. 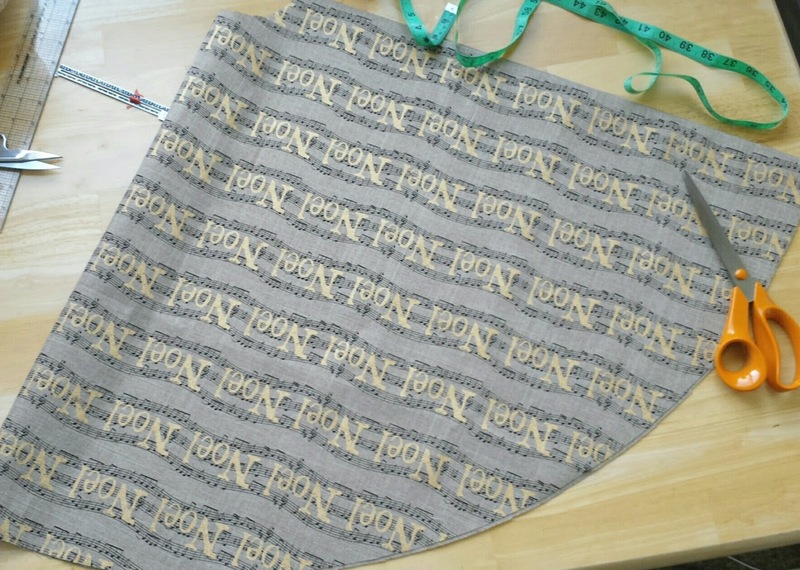 You'll have a bit leftover which you can use to make the ties for the back of the skirt, and place the rest in your remnant bin for another project! The circumference of the skirt is totally up to you. I chose to make mine pretty large since my daughter and her husband have a really tall tree. What that meant was I measured 26" down the fold and 26" down the opposite raw edge of my square and continued marking 26" from my corner point to make the "arc" for my cut line (there are some really good You Tube videos if you'd like an actual visual tutorial on the process, just google Christmas tree skirt). It will also show you how to cut the circle for the tree base and create a center back seam. To finish the center back seam, I used a simple rolled edge hem....and made ties from the same fabric to tie it together at the back of the tree. 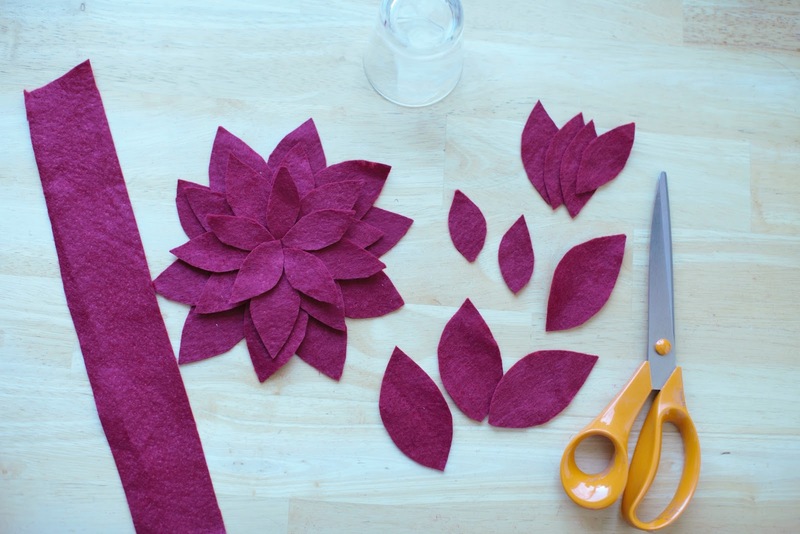 The poinsettias are made from red felt....frankly, this was just eyeballing and cutting three different size petals and hot gluing them to a felt circle. For the two larger petals I used a total of 10; first I glued down 5 petals, then went back around adding the other 5 in the voids created in the first row of petals. The smallest petals I only used a total of 5. To create the center, I placed a dollop of fabric glue and sprinkled gold glitter on top. 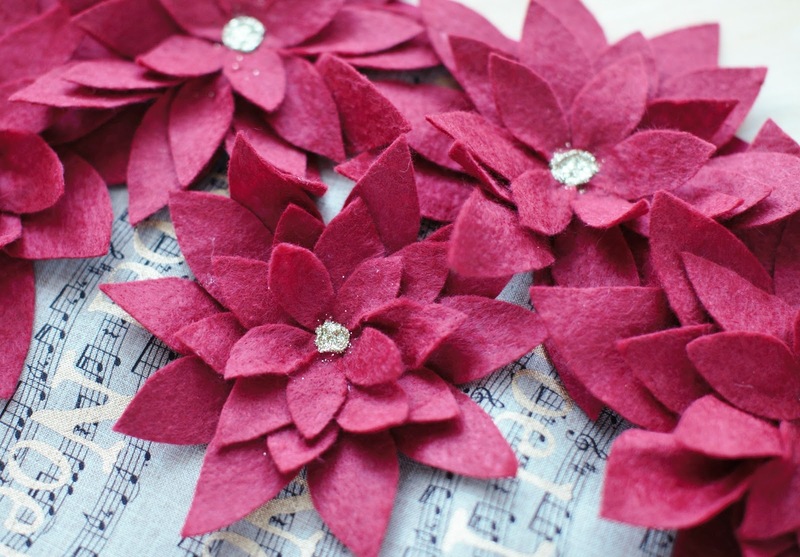 I made a total of 5 poinsettas; 2 large, 2 medium and 1 small. Once I had placed them on the skirt (about 8 different ways before I made my decision), I hand sewed them into place. I think now that I've made this one for my daughter....I need to make myself one! I have this cheapy red felt skirt I bought years ago and every year when I get ready to put the tree up, I vow I'm going to make myself a one-of-a-kind skirt to replace the generic one I have. Who knows, maybe it will be this year?